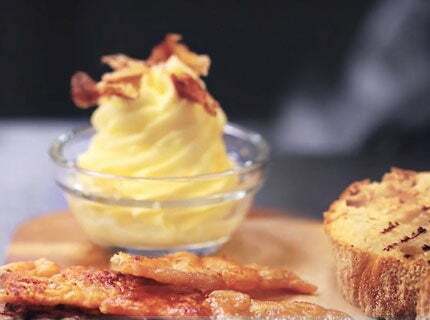 Oven baked crispy chicken skin brushed with our chicken liquid concentrate to enhance the natural chicken flavour, accompanied by a smooth compound butter to spread on warm ciabatta. Delicious! Scrape any fat off the flesh side of the chicken skin, try not to get any holes in the skin. Place onto a lined baking sheet, brush lightly with the CHEF Chicken Liquid Concentrate, top with greaseproof paper and weigh down with another baking sheet. Place in pre-heated oven to crisp. Cream the butter, cream and CHEF Chicken Liquid Concentrate in the mixer until light and fluffy. Either pipe chicken butter into a ramekin, or holding dish or can be placed into cling film and rolled. Heat a griddle pan on high heat, drizzle the olive oil over the sliced ciabatta and griddle. Serve with char grilled ciabatta and crispy chicken skin. Eat within 3 days of making or can be frozen on day of making. A great starter to any meal but you can just as easily use salmon skin in place of chicken or even make a great wild mushroom butter for all to enjoy. Roasted chicken notes and aroma with a delicate body. 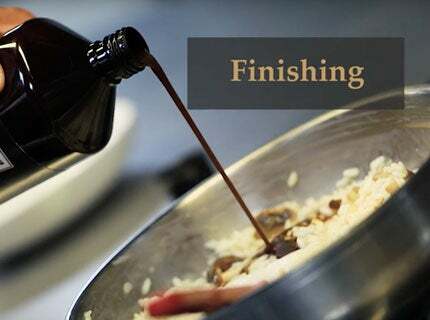 Ideal for dark sauces or ragouts. 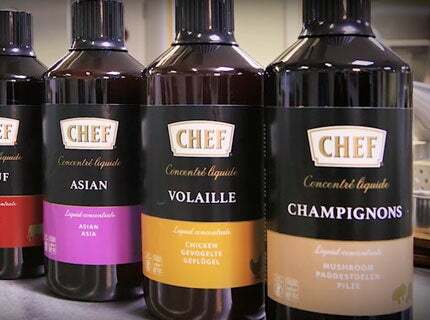 CHEF Liquid Concentrates are versatile and dissolve instantly. In a rich liquid form, you can add them drop by drop to a dish until you get the precise flavour you want.